I just discovered organic beauty site Shop Zoe Online and well, I'm in love. So. Many. Things I didn't even know I needed but do, of course - just check out my personal picks below. What are your personal favorite organic beauty products? I don't have any yet but I'm really looking forward to getting the detox baths and testing the super luxurious (and apparently very effective) mud mask. Bonus for our shopaholic selves: now through April 3rd, everything is 15% off in the April Fools sale! Sea salt, algae and kelp = detoxification. 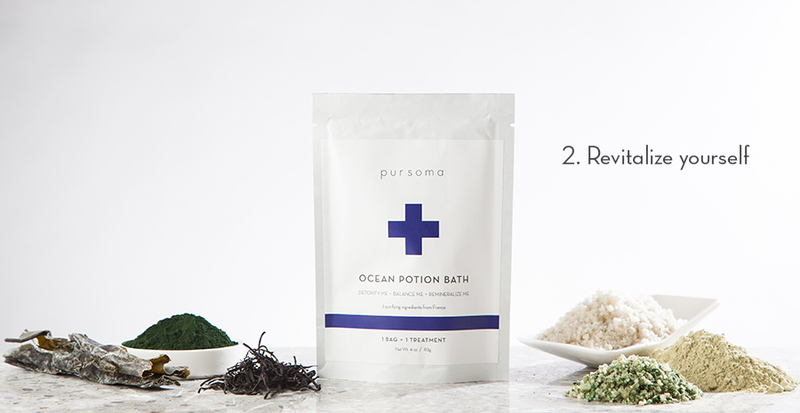 Pursoma recommends a detox ritual where you take one of these Ocean Potion baths once a day for three days. Count me in! You mix this mud mask right before application to activate the ingredients. That means a fresh, potent product each time. Most of us are Vitamin D deficient and don't even know it. This peppermint flavored spray makes it easy to get back to healthy levels without having to add another pill to your daily vitamin regimen. I'm not even completely sure why but this body balm sounds amazing. Maybe it's the argan oil, rose geranium and multiple descriptions of how this will nourish and soften my winter-weary skin? Need this one ASAP. ila body balm for feeding skin and senses, $83. I've tried other natural deodorants in the past but always had disappointing results. I may have even offended a friend or two in the process, ha (sorry guys!). But I'm always looking to try another because I'd like to kick aluminum chlorohydrate to the curb. Bonus points: Zoe herself swears by this cute little jar, which means it's definitely worth giving a shot. Posted on April 2, 2015 by Amanda and filed under beauty, shopping and tagged beauty jet set beauty shopaholic shopping next. Hi, I'm Amanda and I love shiny happy fashion things, travel and my current home of Denver. Follow me as I indulge those loves and bring you an inside look at amazing events, my favorite travel spots, fashion and beauty products. Read more about me on my About page. P.S. has anyone seen my trust fund?